It seems that Phoenix is turning into our way station in the southwest. We like to spend most of our time boondocking, but it’s nice to have a place where we can plugin, do laundry, shop and dine out. That is what Phoenix is to us, a place to recharge, and restock. We returned to the same RV park we’d been at last year. Palm Gardens RV Resort, in Mesa. We’re still not technically old enough for the place, but this time I didn’t even bring up age. The woman checking us in, looked a little hard at me, but didn’t ask for ID. We were, once again, meeting up with my parents. They had been here since the day before, placed just down the road from us, across from the laundry. Staying five days allowed us to get into a pattern of shopping, meeting up for cocktails and then dinner. 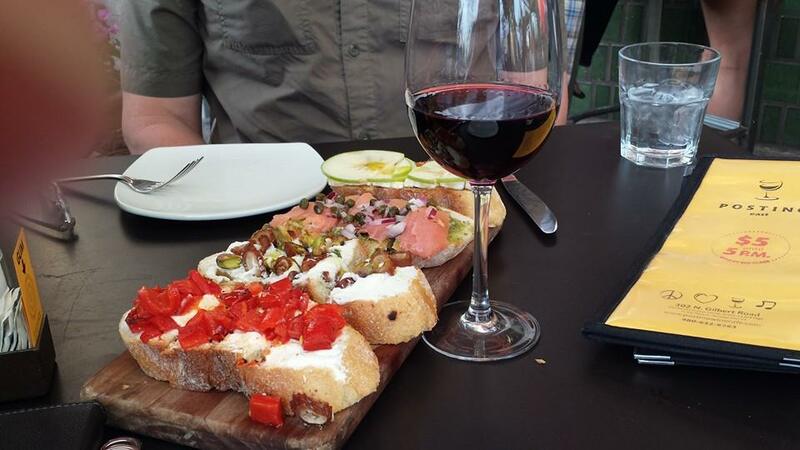 Our favourite late afternoon place is still the Postino Wine Cafe. They have four locations in the Greater Phoenix area. 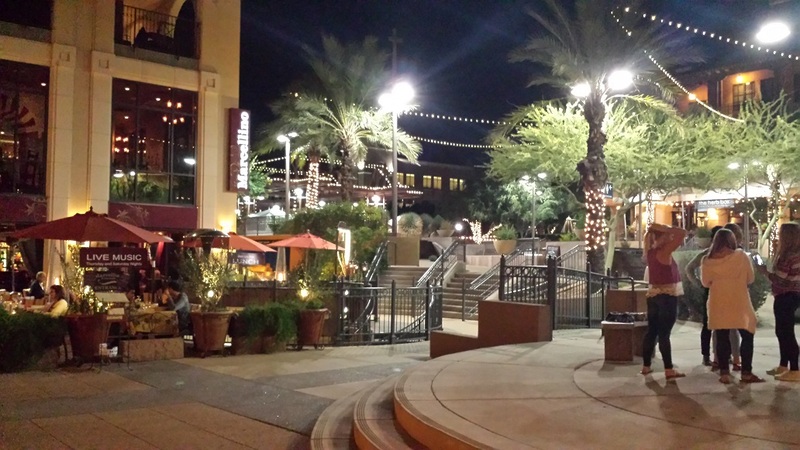 We’d previously been to the Gilbert and Scottsdale locations, and this time we also visited the Tempe location, which is on the campus of Arizona State University. The trick is to get there before 5pm so you can enjoy a great glass of wine or pitcher of beer for $5. Their food menu isn’t extensive, but that’s not important. The only thing we ever want to order is the Bruschetta. You can choose 4 of 12 selections, and they are all just amazing. Most Americans don’t understand the level of intoxication we Canadians get when we shop in the US. Our population is so tiny in contrast and while we do get a lot of similar and same stores, we can’t support the level of commercialism available in the US. We don’t get as many, or as big, and our selection is much smaller – in pretty much everything: band-aids, restaurants, clothes, housewares, food – everything. The first time I walked into a Bevmo!, in Bellingham, WA, I thought I’d died and gone to heaven. A liquor superstore? Who would have thought? So then visiting Total Wine in Las Vegas was like another jolt. This place was even bigger! 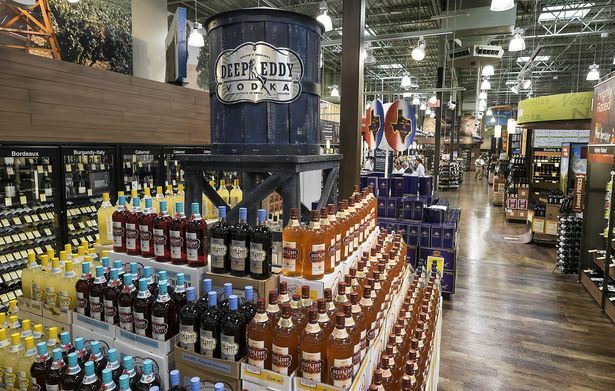 Nothing had ever prepared me for the overwhelming shock, awe, and sheer amazement I felt when we went through the doors to the Total Wine in south Tempe. It was actually too much for me. We wandered the aisles and I felt way too overwhelmed. Thankfully, I had a list, or I’d have never bought anything. I went looking for my new favourite boxed wine, and found every single style and brand you could ever think of. I went looking for beer and it was a football field length aisle of every type of beer I would ever want. I couldn’t focus on anything in that aisle and didn’t buy anything. The one thing I couldn’t find, was the main reason I’d come: Prickly Pear Syrup – for cocktails. We’d seen it being sold in the souvenir shop at Kartchner Caverns just a few days before. I’d wanted to buy it but couldn’t get past the exorbitant price. Googling it showed me that it was available in Total Wines. What’s more Arizona than a cactus cocktail? So how is it, that with everything they have in there, I couldn’t find something they showed on the web site, that is so ubiquitous to the landscape there? “Nobody bought the stuff so we stopped selling it.” said the clerk when I asked her about it. So I guess it’s just one of those touristy things. Bummer. We asked for directions to Bevmo! and they happily obliged. Nice of them, considering they are the competition, but what else could they do? Refuse and look like jerks? Walking through the doors of Bevmo! I felt more relaxed. It was tiny in comparison – still humongous to us, but this felt safer, easier, and I found my Prickly Pear Syrup! I found some other great flavours too. I think really that Total Wines store in Tempe is just too big for me, for my senses to handle. I’d go back, if I were looking for something specific, but for browsing, I’ll take a Bevmo! any day. Prickly Pear Margaritas – it’s supposed to make 4 drinks, but we call it 2 and a half. Directions: Mix ingredients and pour over ice. 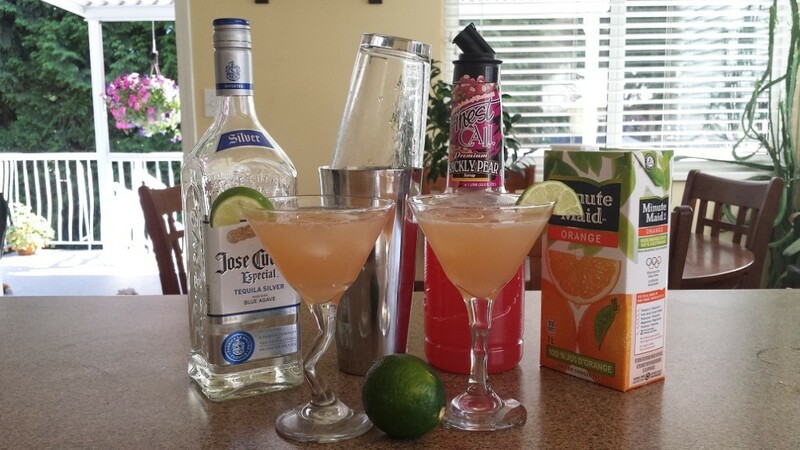 I tried making this Margarita with Jose Cuervo Gold first, then Silver, and finally Patron Silver. The two Cuervo’s were very similar, but the Patron was so smooth it was dangerous to drink. 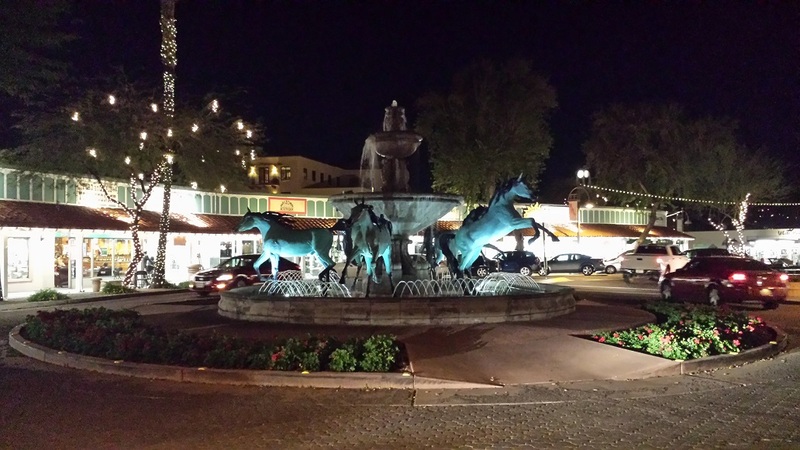 On Thursday, we went to the Art Walk in Old Scottsdale. For 40 years, the art galleries here have opened for night visitors 7-9pm, Thursdays only. My parents told us there were many less places open than when they’d previously visited, but it was an interesting evening in a beautiful location. Some of the art was very commercial, while other pieces were downright hokey, and then there were the ones that were just right. There was nothing I was prepared to buy, but lots I enjoyed looking at. That’s what life is to me, these days, for the most part. It’s part of minimizing life – limit things, and maximize experiences. We had already dined that evening, so next time we visit, we will make sure to come down to one of the gorgeous places here along the river. 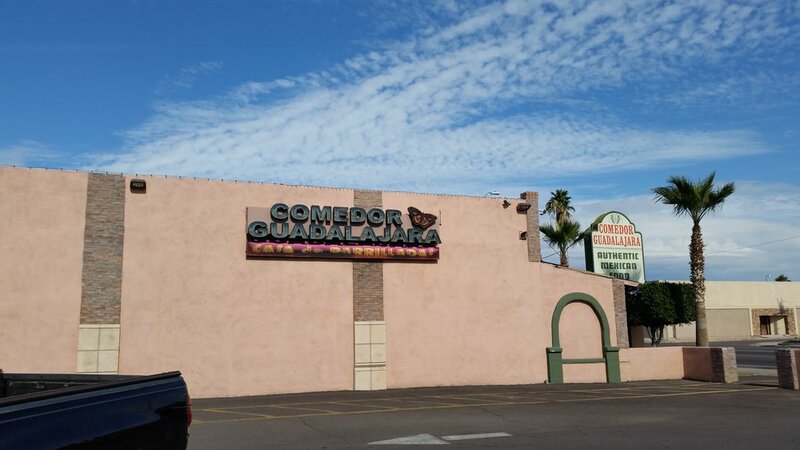 For Harold’s birthday, he’d chosen Mexican, so I googled “Best Mexican in Phoenix” and came up with a long list of candidates. I eventually zoomed the list down to 4 and then down to the final selection, “Comedor Guadalajara“. From the outside, this place looked like a dump. It was right beside the highway and had absolutely no charm. But once inside, it was quite nice, very Mexican looking and quite full already, even though we were on the early side. Our meals were delicious. Their specialty is seafood but they did have some vegetarian options as well. They did not disappoint at all. On our way out, we passed a long line of people waiting to get in. We would definitely go back. We visited the Phoenix Park ‘n Swap for the first time and, just like in Total Wines, I was overwhelmed by the sheer size of it. After awhile, it starts to feel repetitive as well, so after two aisles we had made our purchases and decided to get out of the crowds. The one thing I had wanted to purchase was one of the metal geckos I have seen people put up on the walls of their (more stationary) RVs and home patios. Yeah I know, I just spoke up above about minimizing things, but well, every rule needs to be broken sometimes. 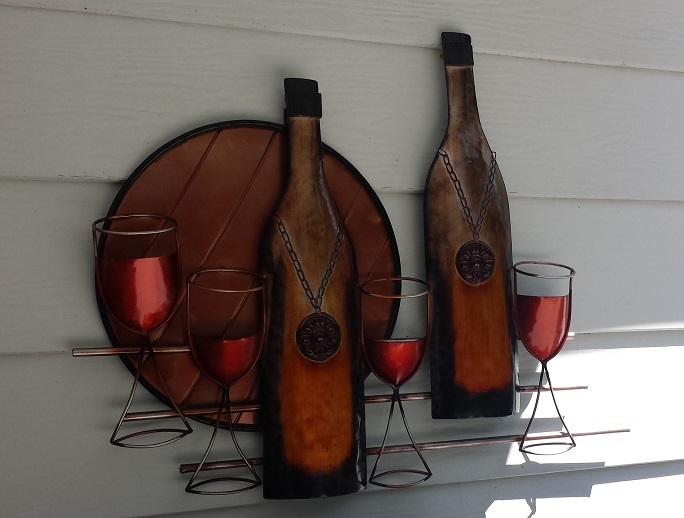 After viewing the selections, we decided the best option was this one, the wine bottles and glasses. It’s quintessentially who we are – winos wine afficionados. Garbage: individual garbage cans for every site. Cell & Wifi: Verizon – 4 bars of 4G LTE.